Sounds simple, I know, but hear me out. Your auditors and enforcement personnel are often the only face your customers see, so it’s important for them to make a great impression. When customers see auditors smiling, they’re less likely to become agitated and more likely to become repeat customers. It’s the same reason customer service agents smile at hotels, restaurants, and retail stores. On top of that, research has shown that intentionally smiling can boost happiness. Happier customers and happier employees make your job much easier, so give it a shot. Foster a culture of smiling with all employees, especially those on the front lines. Obvious? Yes, but we’re constantly surprised by how many operators fail to visit lots during peak times. The goal here is to maximize compliance and customer payment at the meter. Not only should your auditors be identifying violators, but customers should SEE your auditors actively checking vehicles, so they know there’s no free lunch (or free parking). Anecdotally, we’ve observed that customers who *see* auditors checking vehicles are approximately 1,000% more likely to comply and pay the meter. Visiting lots at peak times simply ensures that the highest number of customers see your auditors. The trick is determining each lot’s schedule, depending on nearby attractions, and make sure enforcement personnel are there during peak times. They don’t have to be there every day or every hour, but the goal is maximize the number of people who see your auditors to maximize compliance. Some lots spike during the lunch hour, others during concerts or sporting events. Some stay busy ALL THE FREAKIN’ TIME, while other are random at best. But if you understand each lot’s circadian rhythm, you can optimize auditor’s routes. Shameless plug #1: Spotwise automatically detects your busiest lots in real time, then directs enforcement personnel to them. Try a 60 day free trial! This last tip is related to minimizing voided tickets and false booting. During particularly busy times and in larger lots, auditing a one location can take upwards of an hour. As new customers arrive and pay, stall reports from your multi-space pay stations may not reflect these new transactions. If you’re using printed stall reports, be sure to reprint new ones every 10-15 minutes. If you have digital stall reports, update more often. Here’s the danger, if an auditor doesn’t see a new vehicle arrive (and pay) who’s not on the stall report, they may inadvertently identify them as a violator, leading to false tickets or booting, which must be voided later. Not only is this is a frustrating experience for the customer, but it results in wasted time for your auditors and customer service staff. So remember, in order to reduce voided tickets and false booting, always ensure that enforcement staff are using up-to-date stall reports AND actively observing for new customers arriving and paying. 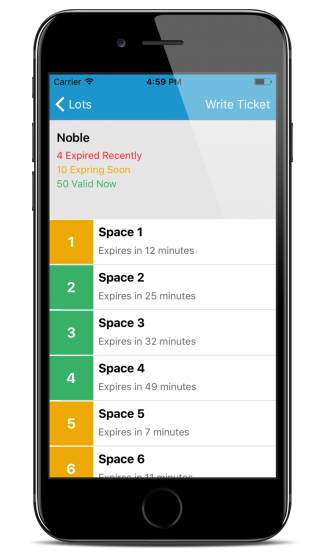 Shameless plug #2: To reduce voided tickets, Spotwise provides easy to read, real-time digital stall reports for all mobile devices. Give us a shot for 60 days, it’s free! What has helped with your auditing for your surface lots? Please share your experience!